AN Fitting & Fuel Rail Adaptor. RB25 Neo Rocker Cover Breather. RB25 S2 Rocker Cover Breather. RB25 S1 Rocker Cover Breather. Fuel Pump - Automotive OEM. Fuel Pump - Inline / External. Fuel Pump - Harley Davidson. Fuel Injector Plugs & Adapters. Fuel Pump - KTM & HUSQVARNA. Fuel Pump - BMW Motorcycle. Fuel Pump - AJP MOTOS. Fuel Pump - Hardwire Kit. Fuel Pump - John Deere. Fuel Pump - POLARIS ATV. Fuel Pump - Arctic Cat ATV. Fuel Pump - Yamaha ATV. Fuel Pump - Moto Guzzi. Fuel Pump - VESPA / PIAGGIO. Fuel Pump - Yamaha Marine. Fuel Pump - MV Agusta. Fuel Pump - Cannondale ATV. Fuel Injectors - ID Injectors. Fuel Pump - 255LPH HIGH FLOW. Fuel Pump - 255LPH WALBRO. Fuel Pump - 450LPH WALBRO. Fuel Pump - 340LPH QUANTUM. Fuel Pump - 340LPH AEROMOTIVE. Fuel Pump - 340LPH E85 QUANTUM. Fuel Pump - 340LPH 65mm QUANTU. Fuel Pump - Machinery/ Tractor. Fuel Injectors - RC Injectors. Fuel Pump - Indian Motorcycle. Fuel Hose / Clamps / Tools. Fuel Pump - 340LPH FUELAB. 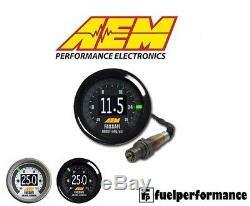 AEM FAILSAFE AFR WIDEBAND AIR / FUEL RATIO AND BOOST IN ONE GAUGE # 30-4900. 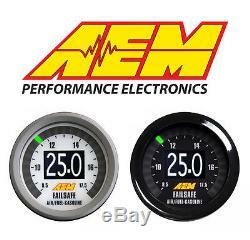 A WIDEBAND AND BOOST/VACUUM GAUGE COMBO THAT CAN SAVE YOUR ENGINE IF IT RUNS LEAN. Since the Wideband Failsafe Gauge is a wideband AFR controller with an internal boost sensor (up to 29 PSIg), it is able to display AFR and either boost or vacuum in real time on a vibrant Organic LED screen. It also includes an on board data logger that records AFR, RPM and boost/vacuum and can be downloaded and viewed in AEMdata analysis software. The gauge includes a low side output for triggering a failsafe strategy in the event AFR falls outside of the operating window, and an RPM input to log RPM for tuning purposes. Displays both boost or vacuum and AFR or Lambda simultaneously on the same gauge. Full color Organic Light Emitting Diode (OLED) Display in center, user selectable feature (boost/vacuum or AFR). 24 three-color sweeping LEDs, user selectable feature (boost/vacuum or AFR). Interchangeable faceplates and bezels (see options, below). WIDEBAND FAILSAFE GAUGE INSTALLATION FEATURES. AEMnet compatible (CAN 2.0). Configurable RPM input for logging. One low-side driver output (Ground with 1.5 amp max draw). Tunable PC-based software with USB connectivity. Time based reset for outputs. WIDEBAND FAILSAFE GAUGE FACEPLATE STYLES. Kit comes with 6 different faceplates and black and silver bezels. Black Vacuum only in sweeping LEDs. Black and White AFR in sweeping LEDs. Black and White Vacuum/Boost in sweeping LEDs. Black Lambda in sweeping LEDs. All AEM products are&###xA0;available! Fuel Performance Limited is an Online Webshop that continues to grow from strength to strength. What are we known for? We offer unbeatable pricing on a continuously growing list of the biggest name brand performance parts in the world. In addition, we pride ourselves on providing specialised fitment kits to all parts wherever possible. We specialise in Fuel Pump Kits for Automotive, Automotive Performance, Motorcycles, Scooters, ATV, UTV, Tractors, Jetski's, Watercraft, Marine and Snowmobiles! We operate globally and have Offices, Resellers, Distributors & Warehouses worldwide. Please be aware that under no circumstances will FUEL PERFORMANCE LTD be held responsible for any labour or repair costs or any other costs incurred from parts found to be faulty, defective or incorrect or any other costs arising from parts supplied. It is your responsibility to make sure you are purchasing the correct item. If you receive your order and find something is missing or damaged you are to make contact with us within 24 hours of receiving your order. This listing is currently undergoing maintenance, we apologise for any inconvenience caused. The item "AEM FAILSAFE AFR WIDEBAND AIR / FUEL RATIO AND BOOST IN ONE GAUGE # 30-4900" is in sale since Thursday, January 7, 2016. This item is in the category "Vehicle Parts & Accessories\Car Tuning & Styling\Air Intake & Induction\Boost Controllers". The seller is "fuel-performance" and is located in Ascot.